If you are looking for information on the Grains of Montana franchise business opportunity, Grains of Montana cafe franchises or Grains of Montana bakery franchising, then you have come to the right place. Do you believe in the importance of fresh bread? Then you have to experience the tasty, healthy meals we create for breakfast, lunch and dinner with one thing in common: outstanding, fresh breads that start with the choicest grains grown on the company's farms. 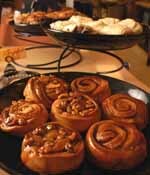 We specialize in freshly baked artisan breads, bagels, pastries, gourmet sandwiches and brick oven baked pizza - made exclusively from all-natural flour provided by the Nielsen family's 15,000-acre Montana wheat farm. Every restaurant claims to be unique. But where else can you buy fresh, steaming hot bread by the slice? What other restaurant knows not only where the wheat for their flour comes from, but that its grown in a rotation to maximize protein content, that it's stored in a safe and clean facility, milled to the right consistency, and that preparation and fermenting methods are tailored to the specific protein level of the wheat itself? Grains of Montana gives every loaf of bread, bagel and batch of pizza dough at least 24 hours to ferment to the perfect flavor profile. 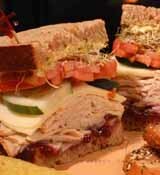 Everything at Grains is made fresh "from scratch" every day including a wide range of fresh-baked artisan breads. You won't find a fresher product, anywhere. An Outstanding Restaurant Franchise Opportunity? You Bet. Act now! Pay no royalties for the first 6 months your restaurant is open. This great deal won't last long! We also do not require prospective franchisee to sign a franchise contract until we have helped secure a suitable location and financing. We know how to run a restaurant - we've done it multiple times, and have taught many others. Grains of Montana's experienced corporate team members (90+ years of success in the restaurant business), are successful entrepreneurs who know what it takes to be your own boss and to successfully run your own business. We function as a partner in the mutual objective of financial success and will assist you in every way possible. However, your ultimate success is up to you. Grains of Montana is designed to offer help and guidance when needed and to let you be your own boss in developing your market. This allows us to deliver customers with key benefits such as variety, taste, and a flexible, adaptable menu. Thus Grains of Montana is not just sandwiches; we are bagels, pizzas and all types of great bread products to bring home. To support the rapid expansion of Grains of Montana we are committed to developing the brand through multiple levels of marketing and public relations exposure on both the national and all-important local level. Act now to grab your own region with enormous business potential. Buy a protected territory at a great price and tap into the rapid growth of this segment by building your own restaurants or attracting additional franchisees. Regions are going quickly and our initial low fee may not last!